Mansouri Family Dental Care & Associates would like to wish all of our littlest patients a safe and fun fall and Halloween season. This time of year is so fun with little ones. Searching for the perfect pumpkins is such a fun memory to make. Aren’t those pictures so cute of the little kids holding a way-too-big pumpkin in their arms just precious? They’re framers! Halloween is also a fun season with children. Creative costume creations and fun fall parties all make this time of year treasured moments as parents. Mansouri Family Dentistry would like to remind you of a few important things to remember during this season to protect their teeth. Increased sugar consumption during the fall is hard to avoid. All of the treats gathered at each of your neighbors’ doors piles up. Limit the candy eaten. Make a good rule for candy consumption as a family. You can also sort through the candy and allow your child to pick their top 10 favorite pieces, and then donate the remainder. 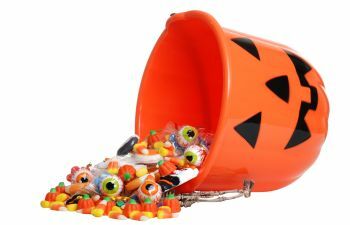 Be sure to increase dental care (such as scheduling pediatric dental appointments) to combat increased candy consumption. Beware of caramel popcorn. Typically popcorn is seen as safe for eating due to its low sugar content and light and fluffy texture. However, the problem for your little one’s teeth is when they accidentally bite down on a kernel that snuck its way into their bag. Cracked teeth can occur. You and your child need to avoid opening treat and candy packaging with teeth. Teeth are meant to chew, not open packing. This habit can damage and crack teeth. Call and book your Atlanta Pediatric Dentistry appointment at Mansouri Family Dental Care & Associates today!